Are you gonna buy Anti-Slip ? choosing the right shoe spikes can be really tricky ! 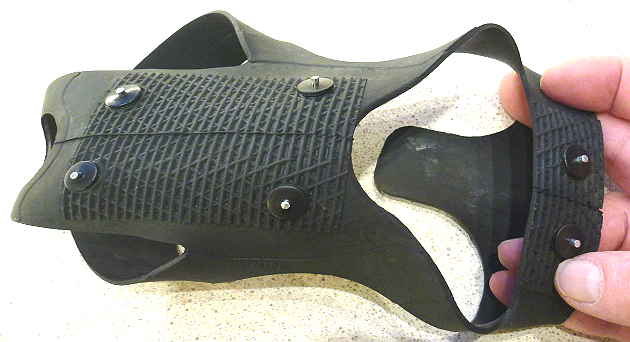 There are a large number of different spikes, but we chose to review two types of slip protection – a pair of spikes that are pulled over the entire sole, and a pair of heel-spikes. We tested the spikes for two days, with a half-hour walk per day. 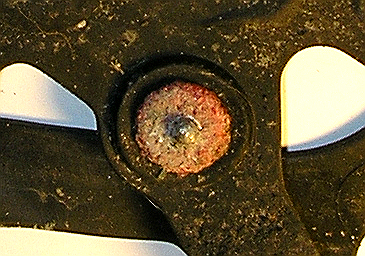 The heel spikes were admittedly worn, but not as worn as the removable stitches. The yellow arrow indicates that one of the spikes has disappeared / disappeared. Spikes are generally quite expensive. They are in the price range between EUR 20-50 ($ 22-57) and we are surprised that they have such a low quality. 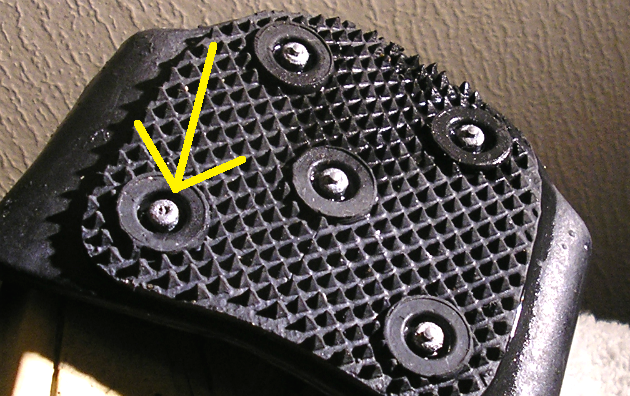 The removable spikes were the worst, with four spikes away after two half-hour walks and clearly outworn studs. 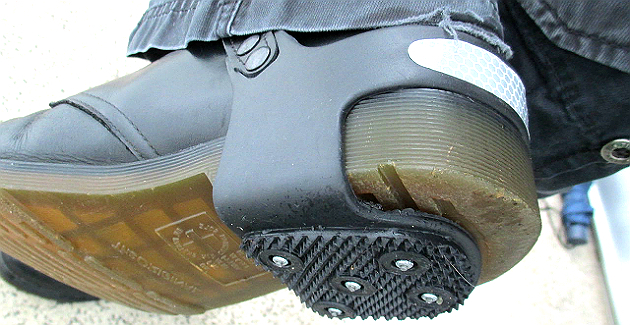 The heel-spikes were slightly better, because the wear-out effect was not as great. However, we lost a stud when we got home. How long do the spikes last ? 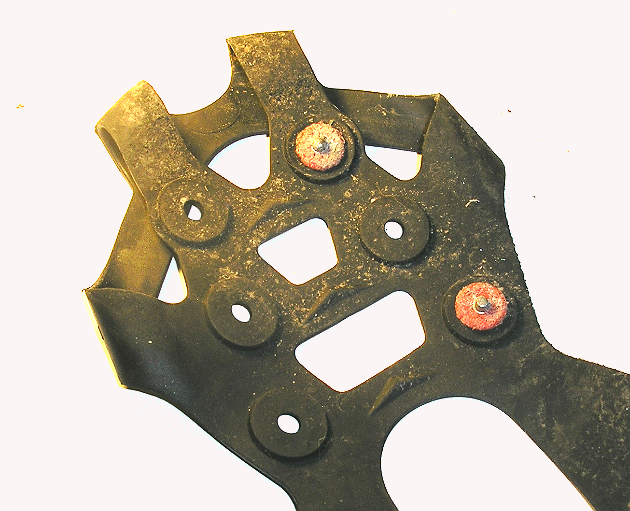 Our tests have shown that the spikes only have full effect about one hour, but that they have a certain effect even after that (even though the metal on the studs is worn out). 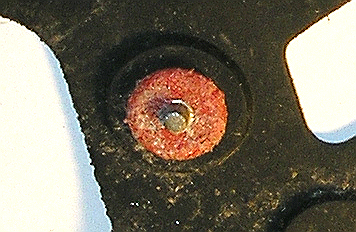 Considering that they last that short, it often becomes a very expensive business to buy spikes. The distribution of free spikes to retirees has not had the effect that the municipalities have wanted. Fewer people than they have counted on, are using the spikes. The reason is often that older people have too little force in their hands and cannot pull on and off the spikes over the shoes. A solution can therefore be to use only heel-spikes if you are older and weak in your hands, as these are not as difficult to get on. However, you have to adjust your walking manér quite a bit, since you only have slip protection on your heels. You might have to look a little at the metal’s durability, and find even harder materials to make spikes off. You would also need to work a little on the construction, so that it will be easier for those who really need spikes – our retirees – to use them.